The French use the term terroir to refer to the environment — particularly the soil and climate — that gives certain artisanal foods and wines characteristics that reflect the place where it originated. I never thought of using terroir to describe an electric solidbody guitar before, but after playing the Heritage Standard H-150 I’m hard-pressed to think of a better word to explain what makes it so damn irresistible. I’ve played more than a hundred guitars from dozens of companies both domestic and imported that are based on the coveted late-Fifties Les Paul Standard with dual humbuckers and a solid carved figured maple top laminated to a single-cutaway mahogany slab body, but I don’t recall any that have come as close to the tone, feel and overall vibe of the original version as much as the Heritage. The reason for that is because the Heritage H-150 is made like the original model used to be made and, equally importantly, where it used to be made, in the same factory in Kalamazoo, Michigan, where this classic solidbody design was born. 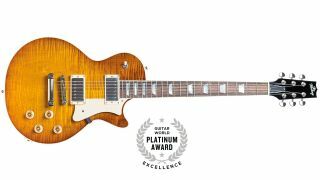 For those of you unfamiliar with the Heritage story, the company was formed by ex-Gibson employees who refused to move to Nashville when Gibson relocated its factory there in the mid-Eighties. Several of the founders, who are still working with Heritage today, were building guitars in the Kalamazoo factory back in the Fifties and know every detail and trade secret behind the construction of the most desirable models. But while many other builders today also know the same details and secrets, what makes the Heritage H-150 truly special is something I can only attribute to Kalamazoo terroir. FEATURES What is truly impressive about the Heritage H-150 has more to do with how closely it resembles an original Standard rather than how much it has been refined. There are a few small differences, such as the obligatory headstock shape change made to avoid violating trademarks, the use of Grover tuners instead of Klusons (reflecting a common player upgrade during the Sixties and Seventies) and a beveled pickguard with a shape that better complements the body’s curves, but overall much remains the same. Notable details include the use of a single solid slab of mahogany for the body (no tone chambers or weight relief), the one-piece mahogany neck and the carved maple top cut to the proper thickness. The nitrocellulose finish is lightly applied. The neck has 22 Jescar medium/jumbo frets with a crown sure to please vintage purists and slim, narrow C-shape profile that resembles the most comfortable and fast-playing circa-1960 necks. The electronics and hardware reflect an emphasis on quality over cost-cutting measures and include CTS 500K pots, Vishay .022uF capacitors, a Switchcraft 3-way toggle switch and Pure Tone output jack. The bridge and tailpiece have the classic Tune-o-matic design but lock securely into place for enhanced tone, dynamic response and tuning stability. Capping this all off is a pair of Seymour Duncan 59 fullsize humbuckers with nickel-plated covers. PERFORMANCE I own several Kalamazoo-made guitars built before 1984, and no other guitar I’ve played made since then has come closer to them than the Heritage H-150. In the hands it feels like an old familiar friend, albeit one that has stayed in incredibly great shape. The H-150 plays like an incredibly fine vintage Standard, but more importantly it sounds like one too, from the aggressive grind of bridge pickup to the seductive “woman tone” of the neck pickup with its tone control backed down. One could spend 100 times more for a vintage Standard, but why settle for Les when you can still enjoy the real deal for a whole lot less?